Named for the address at which it is located. 2101 Connecticut is one of Washington, DC’s grand old buildings. Built in 1928 as very high-end apartment homes, the imposing 9-story structure was later converted to a cooperative with 64 extremely spacious residences. 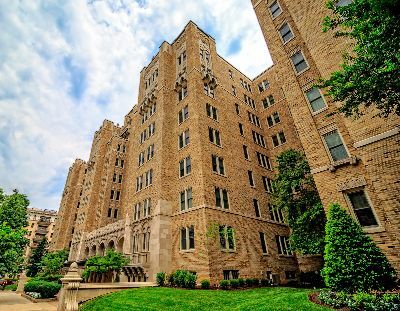 Combining Beaux-Arts and Federal influences, the complex with its clean lines and projecting wings, is located at 2101 Connecticut Ave, NW, between Kalorama Road and Wyoming Avenue. This is the posh Kalorama neighborhood, known for its embassies and many other notable buildings, including the Woodrow Wilson House and the luxury condos for sale at 2029 Connecticut. 2101 Connecticut has always been known for its super-sized living quarters. An advertisement in the Washington Post circa 1928, described the building as “Washington’s Distinctive Apartment,” with residences ranging from seven to nine rooms, with three baths, an enclosed porch and servants quarters. Today, many those original layouts are still in place, with co-ops for sale at the building ranging in size from 2,800 to 6,400 square feet. Floorplans at 2101 Connecticut start at four bedrooms—imagine that in such a crowded city? With soaring ceilings and beautifully inlaid herringbone as well as strip hardwood floors, these stunning homes offer a style of living that bespeaks a different era in time. The rich interior architectural details include wainscoting, arched passages and thick crown molding. The building is listed on the National Register of Historic Places and has been home to many Washington notables over the years. Passing by the stone gargoyles and guardians that protect the exterior, visitors to 2101 Connecticut will enter a stunning grand lobby with 16-foot ceilings, marble floors and a 24-hour staffed front desk. The building offers parking, a fitness facility, a laundry facility, a private business center, extra storage and a private roof deck with panoramic views of the city. Coops for sale range from $1.45 million to $4.5 million. 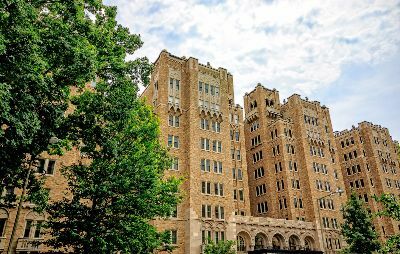 The pet-friendly building is in the Kalorama Triangle Historic District, with the popular Adams Morgan neighborhood directly to the northeast and Dupont Circle to the south. Residents can stroll a couple blocks to the lovely triangular Kalorama Park and are also close to the wildly popular 18th Street Restaurant Row. For more information about 2101 Connecticut, call District Partners Real Estate at 202-798-3600.